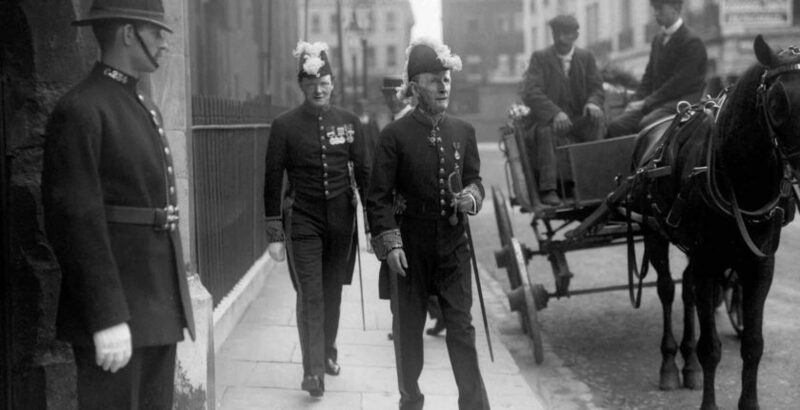 Above: Churchill with John Morley in court dress, 1908. Morley might have kept Churchill on the original Liberal path, Hill writes. But Campbell-Bannerman rejected Morley for the Exchequer, and Asquith appointed Lloyd George, whose plans were thwarted by landed interests. In 1914 Morley resigned over going to war on the side of Russia, ending his influence over the Liberal government. In 1906 Winston Churchill and his fellow Liberals swept into power with what they saw as a reform mandate. The new prime minister, Sir Henry Campbell-Bannerman, held it the government’s responsibility to create what Churchill called “a Minimum Standard.” Below it, no citizen should be allowed to fall. While not nearly as comprehensive as Roosevelt’s “New Deal” two decades later, Churchill’s Liberals began to create a welfare state, and might have extended it had World War I not intervened. 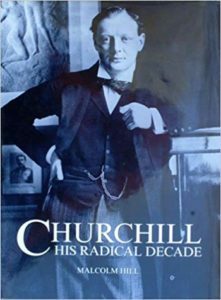 The “radical decade” began when Churchill quit the Conservatives for the Liberals in 1904. After the Liberal landslide of 1906, he became a junior minister under Campbell-Bannerman, with whom he shared an understanding of the actual causes of poverty. “Churchill did not believe the state should take responsibility by taxation for retirement, education, health and welfare,” Hill states. But he showed “unusual stature” in his efforts to mitigate poverty. Churchill was attracted to John Morley, a leading party thinker. Morley in turn admired Turgot, controleur general of France in 1774-76, a “statesman of the Enlightenment, who projected the idea of a just society when agriculture engaged most people.” Another Liberal, Charles Trevelyan (brother of the historian G.M.) introduced Churchill to the works of U.S. economist Henry George, a great influence on young Winston. The premature death in 1908 of the Sir Henry Campbell-Bannerman altered the course of reform policy. Campbell-Bannerman’s successor, H.H. Asquith, “had no creative political imagination,” Hill writes. He allowed David Lloyd George, “a dazzling performer,” to formulate domestic policy. Winston Churchill was his “admiring lieutenant.” Once Churchill attached himself to Lloyd George, true reform was “lost to political expediency.” Lloyd George had no political principles, writes Hill. His landed colleagues persuaded him to abandon Georgist ideas of land value taxation. …all taxation is an evil, and so far as taxation itself is concerned as a mere process of raising money, it is an evil “harsh, unmingled, and unmitigated.” When the State takes from the earnings of the community money which it needs for national purposes, however vital, withdraws that money from the healthy fructification of industry, it diminishes the consuming and productive energies of the people, and it rests with the State to prove at every moment that the employment of the money which it raises conduces to a greater commercial profit than if it had been left to private persons to use, or else that the money is needed for purposes which have to be justified on grounds of necessity quite apart from economic ones…. …what are the root principles of British taxation…? They are very simple. A child can learn them; only a fool can misunderstand them. Here they are. First, no more taxes than are necessary; secondly, what taxes you have let them be substantial and effective taxes; thirdly, change them as seldom as possible; fourthly, let the taxes be such that the whole yield of them goes to the public Exchequer, and that there is no opportunity at any point for private persons to get an advantage or profit out of those taxes. Larry P. Arnn: Churchill’s Trial: Winston Churchill and the Salvation of Free Government. 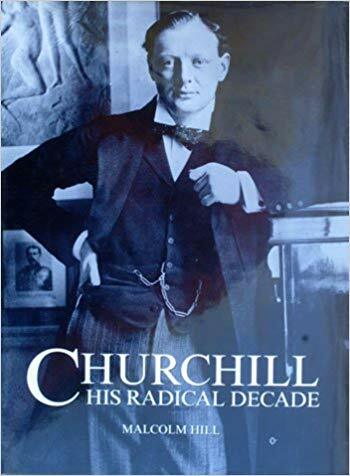 This is the definitive work on how Churchill saw the challenge of how to “provide for the general welfare” (in the words of the U.S. constitution), while preserving individual liberty within the constitutional framework. Unlike Hill, Arnn considers Churchill’s full career, and the challenges in war as well as in peace.